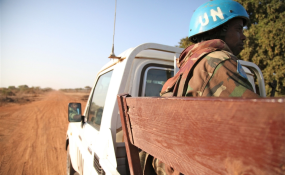 The United Nations Interim Security Force for Abyei is helping to keep the peace. Sudan and South Sudan have agreed to withdraw their respective troops from their contested borders within one month, officials confirmed. The Defence ministers from the two countries said in Khartoum on Monday that the neighbours were determined to resolve the border dispute that has been pending since South Sudan's secession in 2011. South Sudan Defence minister Koul Manyang Juuk said the withdrawal of troops would be followed by the formation of the buffer zone that had been agreed on earlier. "It has taken many years and a lot of meetings with the help of the United Nations Interim Security Force for Abyei (UNISFA) to effect the cooperation agreement," said Lt Gen Juuk. South Sudan seceded in 2011 following a referendum on self determination, but several issues remained unresolved with Khartoum. The African Union High Level Implementation Panel, led by former South African President Thabo Mbeki, has led the talks between the two neighbours since 2011 to resolve the pending issues. The neighbour's disputes have revolved around the demarcation and demilitarisation of the border, support to rebels and the fate of the Abyei people, who were expected to hold a referendum on self determination. A sign of their thawing relations saw Khartoum preside over a peace deal between the South Sudan rival factions last August. The Sudanese military Chief of Staff, Lt Gen Kamal Abdul Maroof, confirmed that the two countries would send a joint technical team to the borders with the monitoring of the UNISFA to follow up the demilitarisation and the opening of the crossing points within one month. "We would also send a joint technical team to follow up the implementation of our agreement," he emphasised.